Here’s an updated analysis of visitors to this site comparing the proportions using Mac and PC operating systems. As I’ve said before, you’d have to be pretty crazy to visit this site of you’re not a Lightroom user, so I think it’s a pretty good approximation to the wider user base. 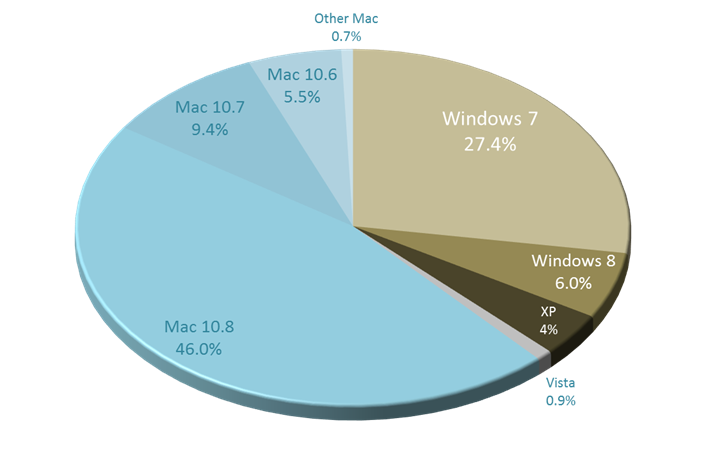 The 60%:40% Mac:PC split shows a continuing drift to Mac – a year ago it was 50:50. But for me the most interesting detail is the less than 6% using Mac 10.6 or Snow Leopard. Lightroom 5 will not run on that OS or on Vista, and that figure happens to be about the same level as Windows XP users when Lightroom 4 came out last year.